I've gotten questions from people over the years about long account numbers/lots of segments, so I thought I would put together a short list of the pitfalls of very large account numbers. One recurring issue, at least in my experience, is clients keeping their Accounts Payable control account reconciled to the AP Trial Balance. A frequent contributor to this is general journal entries being posted to the control account. We're going to look at the way to prevent this, not just in the AP account, but all control accounts in your general ledger. Account Rollups - not as tasty as Fruit Rollups but just as Satisfying! An oft-overlooked feature in GP Financial Inquiry is the Account Rollup. If you have a need to monitor the total of a group of accounts - say multiple inventory accounts – that may or may not be in consecutive account number order, then this is the tool for you. 2. Choose Modify to open the Account Rollup Inquiry Options window. 3. Enter a name for the option you are creating. What do those strage reference codes in GL mean? The following applies to inventory items with a valuation method of Average Perpetual, LIFO Perpetual, or FIFO Perpetual items. 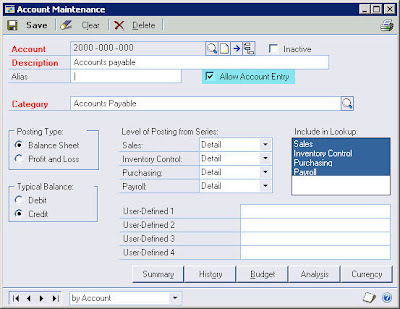 As of the release of Dynamics GP 9.0 the system will automatically generate General Ledger adjustment entries for situations where an item was sold or consumed from inventory, but its cost was later changed. In earlier versions of GP, adjustments to Inventory and COGS needed to be entered manually to correct the accounts used by the transactions that sold or consumed the items. As of Dynamics GP 9.0, those adjustments will now be automatically generated. You will see different codes in GL (MCTERCT for example) depending on the type of transactions entered and timing of the transactions. 2. MRCTRCV - If the items were issued in Mo Receipt Entry (they are backflushed) and then the invoice is complete the adjustment will have a prefix of MRCTRCV. 3. MCLSRCV - If the items were issued in the MO Close process (the MO was partially received and more backflushed items were issued during the close) and then the invoice is completed the adjustment will have a prefix of MCLSRCV. Whenever Post through GL in Posting Settings for subsidiary modules, General posting Journal will be printed when an entry is posted in subsidiary modules. What if, we want to skip this General Posting Journal in subsidiary modules while retaining the ability to print the same for direct GL entries. Mariano Gomez provides a smart solution (as always ) for the same using Report Writer in response to a question raised in Dynamics GP partner Forum. It's summer time in Montana so that means fly fishing and farmers markets. Oh how I love summertime. All two months of it. (It might end up only one and a half months this year as it's barely starting to warm up now). This one is something very simple yet worth knowing and keeping it on mind: Under what circumstances can a duplicate J/E # be created? This feature is very helpful if you need to copy a certain range of accounts to create a new range. For example, let's say you need to setup a new department in you chart of accounts. Rather than setting each account up one-by-one, use Mass Modify to set them all up at once. 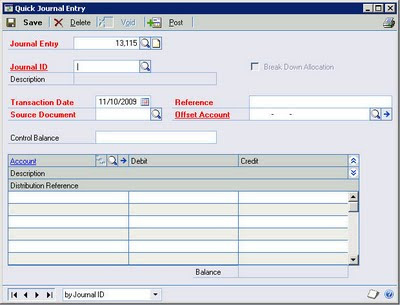 The Quick Journal is an excellent tool for posting recurring journal entries where the accounts stay the same from period-to-period but the amounts change. A good example of this is a Monthly Vacation Accrual. Some features exist in Microsoft Dynamics GP that have been there ‘forever’, but are not given much attention. 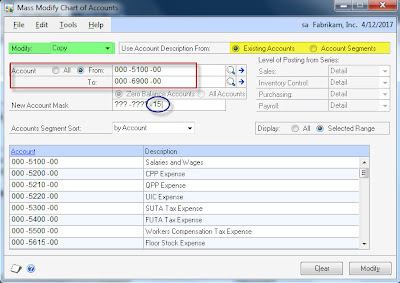 This post explores the ‘Include in Lookup’ option on the Account Maintenance window. We all know that we can increase the number of characters in an account segment up to the maximum number allowed in the Account Framework. However, if we need to REDUCE the number of characters, all of the documentation tells us we cannot. Once upon a time there was not an option to display an expanded account width. Therefore, if you wanted to use an alphabetical character instead of a number, the alphabetical character would not be displayed if it was wider than a number. The only way around this limitation was to make the segment an extra character long.